And another day under my belt... Love re-inkers and all they can do. Although I keep forgetting about the marbling technique... and after trying an idea I had - doing re-inkers on glossy cardstock - it will be one of my go to techniques for backgrounds. Loving the effect. 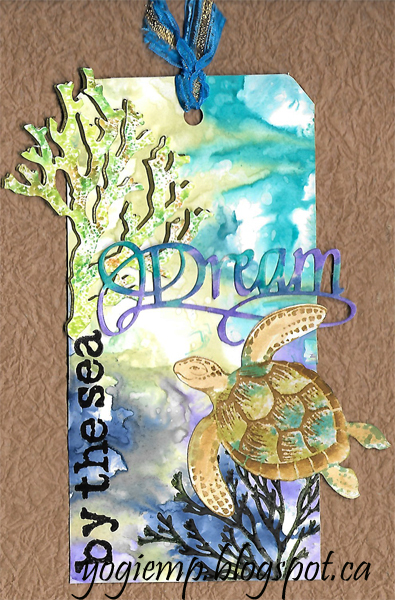 Using a bunch of Designs By Ryn stamps from the Sea Creatures sets 1 & 2. Loving these sets. 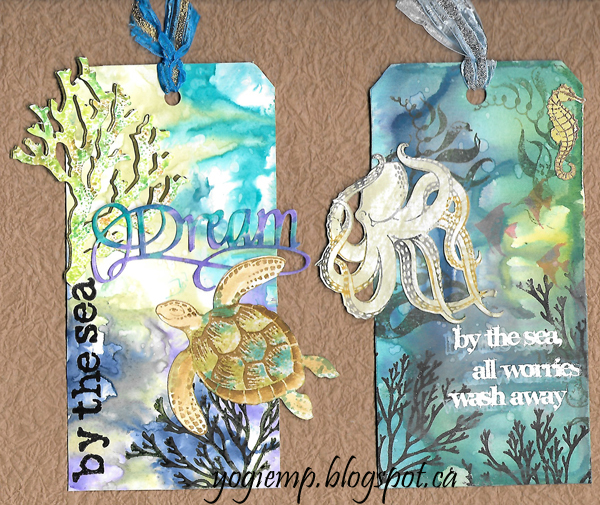 Cupcake Challenge #363 cupcake inspir "Under the sea"
Wonderful underwater scenes on these tags. So much depth in the second tag with the faint stamping of some of the images. Love how you did the sentiment on that one, too. Hey Yogi! 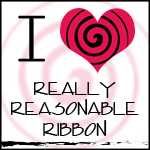 Great to hear from you again :) I love how you use cut outs of the designs to add depth. Beautiful watery scenes! Love your beach themed tags! Gorgeous! 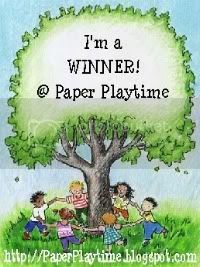 Thank you for sharing with us at MFP Stamps Challenge. Such a pretty tag.I love the images used. Thank you for joining us at Craft your passion Challenge.Best of luck. Hi again Yogi, I totally missed Fashionable Stamping Challenges on your list so popped back to thank you for joining in. Just noticed my first comment is missing so not sure what happened there but had said thank you for joining in at Stamping Sensations with your fab tag. This is absolutely amazing Yogi.. Seriously magical and fluid scenes are so dreamy and wonderful... How many adjectives do I need to use to tell you how wonderful this is.. The animals whimsically floating in and/or out of the scene is what makes it so special.. All I have to say is WOW!!! thank you for gracing us with your presence. Your work is amazing. Thank you so much for joining us at MMM. Take care. Wowwww, your TAG is fanstic. I love it! Thank you for sharing at Fashionable Stamping Challenge. WOW! 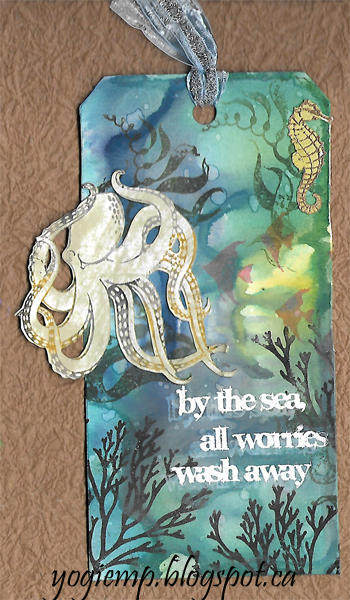 Breath-taken-away with the stunning underwater scenes you've created! Colours, images, dimension...I'll second Shawna's comment: magical, dreamy, fantastic! So glad you shared this gem in the Cupcake Inspirations gallery! What amazing ocean backgrounds! These are spectacular! So glad you were inspired by this week's Cupcake Inspirations challenge! Beautiful Card! Love all your embellies! Thanks for playing with us at Craft Your Passion! Really gorgeous tags and love the underwater details. Thanks for sharing your creations with us at MMM. Stunning underwater colouring. Loving the introduction of the sealife too. I am so pleased you were so inspired byour challenge. Thanks for hoining us at Make My Monday. Caz DT.